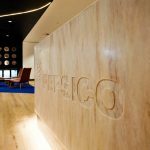 IA Design were engaged by one of Australia’s leading fitout, refurbishment and construction firms, Renascent, to design their new head office location in St Leonards, Sydney. The brief called for a mix of open plan workstations and enclosed office spaces, to accommodate the Renascent staff and leadership teams, as well as a number of small meeting and a 12-person boardroom. 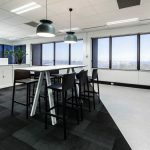 Beyond the workstations, Renascent sought to create a dynamic breakout area that would encourage employee connectivity and take advantage of the sweeping views from the 102m2 balcony. The floor plan was designed to encourage a natural flow onto the balcony, with an open breakout and kitchen area that opened onto the balcony with a BBQ area. A key highlight of the office space is the character-filled reception waiting area, featuring bronze metal pan ceiling, timber flooring and smoky mirror walls. The stunning reception desk stands as a feature element in the room with a quartzite Smeraldo polished stone from Italy supplied by Artedomus, creating a moody and intimate atmosphere. The tender and construction was managed and run by Renascent themselves. A fantastic end result.